King's School uniform is smart, stylish and distinctive. Our logo represents the Holy Trinity: God the Father, Son and Holy Spirit. The uniform is affordable, durable, machine washable and ethically sourced. 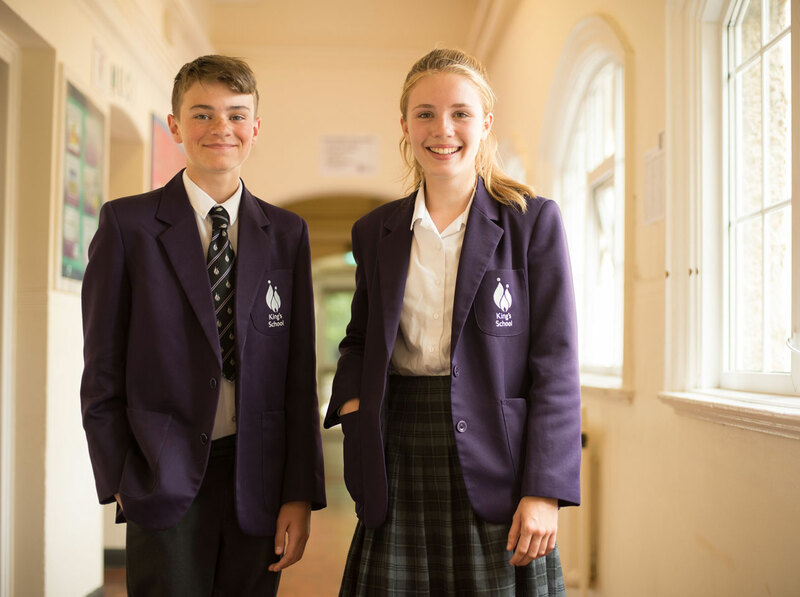 We believe that good standards of dress promote a positive attitude to work and behaviour and identify our students to local residents and future employers. The co-operation of all parents/carers is requested to ensure that students are in correct uniform to and from school as well as during normal school hours. Please note, King’s makes the final decision as to what is acceptable in all aspects of a student's appearance. The item list below describes the uniform. We hope your child enjoys wearing it. Dark purple blazer with King’s silver thread badge on the pocket (girls' and boys' cut available). Stitched pleat ‘grey granite’ tartan skirt. Knee length or just above the knee. Short skirts strictly not allowed. Boys' traditional stiff collar white shirt – short or long sleeved. Top button done up. Girls' revere collar white shirt – short, 3/4 or long sleeved. Plain black shorts with King’s logo. Optional purple and black half zip sweatshirt with King's logo. Hairstyle is an important aspect of the image each student creates for King’s. No shapes cut into the hair e.g. stripes, ‘tramlines’. Long hair must be tied back when requested by teachers as a safety precaution. Typically this will include certain lessons in PE, science and technology, otherwise the students are free to wear their hair as they wish. Any hairbands must be plan and discreet. Watch. Medic alert chain, if necessary. One small silver, titanium or gold sleeper or stud may be worn in the lobe of each ear. No other jewellery or body piercing is acceptable, including wristbands. Discreet foundation is permitted. No nail varnish, lip stick, eye shadow, mascara, eyeliner or heavy black lines etc. Should be black and be able to carry a minimum equivalent of 2 A4 ring-binder files, pencil case and water bottle. No handbags allowed. Optional black PE kit bag sourced from Logosports. We have chosen to use a local supplier, Logosports, in Hove. As well as supporting a local business, we wanted to make it easy for parents to buy the uniform and also to make sure that there were no hidden postage costs. Logosports are based in Industrial House, Conway Street BN3 3LW. 01273 321209.